Friday hawt chicks & links – The grid girls edition. The big news today should be the imminent release of this memo showing that all the democrats and FBI are bad and evil and treacherous, and all of our side are good and pure and innocent. But this has been overshadowed by a factor of a thousand by the news that Formula 1’s new American owners are ditching the grid girls effective immediately because “it’s not in line with their brand”. As far as the lovely ladies not being in line with their brand, what is exactly in line with their brand? Perhaps they’re going to get Triggly Puff to breathlessly wave her arm fat rolls as the cars streak silently by the finish line? That about sums up the state of F1 now. Enough sadness, onto the links. Trump delivered his first state of the union address. It went down rather well. And that is how your make their memes belong to you. Events like these remind us on a near daily basis that Hillary Clinton! will never be president. But if she had won her unloseable election? She would have rewarded a lot of people which explains their criminal behavior leading up to the big day in November 2016. Had Hillary Clinton polled ten points behind Donald Trump in early 2016, we’d have none of these scandals — not because those involved were moral actors (none were), but because Hillary would have been considered yesterday’s damaged goods and not worth any extra-legal exposure taken on her behalf. Similarly, if the clear front-runner Hillary Clinton had won the election, we’d now have no scandals. Again, the reason is not that she and her careerist enablers did not engage in scandalous behavior, but that such foul play would have been recalibrated as rewardable fealty and absorbed into the folds of the progressive deep state. And what would she have done with those her had broken the law to favor her? The only mystery in these sordid scandals is how a president Hillary Clinton would have rewarded her various appendages. In short, how would a President Clinton have calibrated the many rewards for any-means-necessary help? Would Lynch’s tarmac idea have trumped Comey’s phony investigation? Would Glen Simpson now be White House press secretary, James Comey Clinton’s CIA director; would Andrew McCabe be Comey’s replacement at the FBI? Something else to consider – yes, she would have rewarded these loyal criminal flunkies. But she would also have owned them because of the crimes that they had committed. And thus they would have been pressed into committing more and more crimes during her administration. An Australian university has banned one of their scientific professors from speaking out on the destruction of the scientific process, and are threatening him with the sack if he doesn’t shut up. Last August Professor Peter Ridd said the unsayable — that we can no longer trust scientific institutions. His employer, James Cook University (JCU) could have explained why they were trustworthy, but instead they fired back with a formal censure and ordered him to be silent, effectively to stop him criticizing the current state of science or scientific institutions. Then knowing exactly how respectable, ethical, and scientific this is, they also ordered him not to mention the censure too. Let’s censor the censure! It gets dirtier, apparently now they are even trawling through his private emails as well, hunting for more ammunition for their misconduct case. Who’s a bit desperate? If what the professor is saying had no basis in fact then they would not seek to censor him. The attempt to shut him down gives great credence to his claims. And his claims are pretty explosive. The Millennials are now old enough to start making films and stuff! Awesome! How do you think that’s going? Sundance 2018: Awful and boring. Ugandan president backs Trump’s shithole remark. “I love Trump because he speaks to Africans frankly. I don’t know if he was misquoted or whatever. He talks about Africans’ weaknesses frankly,” Museveni said in the capital Kampala to members of the East African Legislative Assembly (EALA). Uganda hasn’t been in the news for the last 30 years because of this guy – a benevolent dictator which is the only form of government that works in Africa. When he goes, watch Uganda do another period that will put the 1970s to shame. The Chateau has an in-depth piece on the single mommy plague. The risk of allowing our affluence to normalize a high rate of single mommery is evident: If in the fullness of time our 40% single mom rate metastasizes, there will be YUGE downstream consequences and emanating penumbras from what would amount to the wholesale destruction of the Eurasian family structure that has existed for millennia. Each generation laboring under a grossly high single mom rate will slowly inch the character of our women away from K-selected Euro monogamy and toward r-selected African polygyny/polyandry. What starts as a social selection pressure eventually ends as a genetic selection effect. 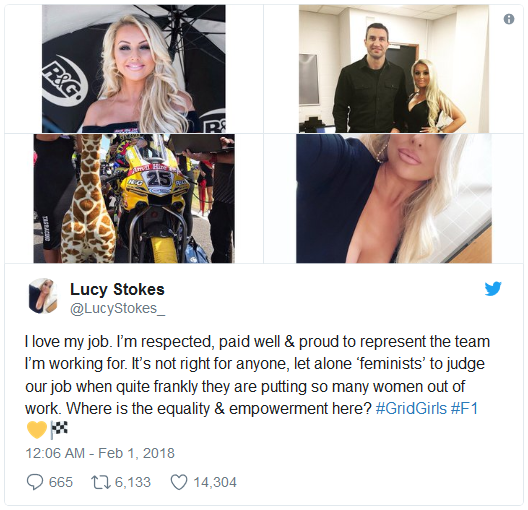 It’s women like this horrible lying feminist cow that caused the lovely grid girls to lose their livelihoods. What the plaintiffs are clearly seeking is for the district court to issue an injunction to block DeVos’s authority, with no hope to reverse this without taking the case all the way to the Supreme Court, a process that could take years. Why? Because drunk sluts now believe they have a “right” to punish any guy they hook up with when they’re drunk. This punitive regime is necessary for women like Laura Dunn, enabling their belief that they’re victims of “heteropatriarchy,” instead of having to accept the ugly truth about their own immoral behavior. The right woman for the job. The world has moved on from movies. Like painting, the novel, and the orchestral music piece, the movie is an art form from another time. In 100 years, people will look back on this century’s great art and they won’t be talking about the movies being made. They will speak reverently about and write weighty analyses of the computer games, the web sites, or something else that we don’t even recognise as art right now. Lets not forget that Jane Austen’s novels, in their day, were trashy soaps written by and for women; and that the great paintings of theirs were commissioned by vain rich people. American owners, Liberty Media, axed the grid girls because they didn’t want to “objectify women”. They didn’t want to portray women as objects of sexual desire. That is like saying they want to stop the earth rotating around the sun. If a girl is attractive (for example, a grid girl), high ranking men will want her eggs. If a girl is unattractive & nice, lower ranking men will want her eggs. And if a girl is unattractive and not nice, the lowest ranking men aka ‘soy boys’ will try to get her eggs or no man at all. Sexual desire is a trade for the resources of men to raise children. And women will do anything to increase their sexual desire to men. Otherwise they are failed female human beings. No offspring. Stick that in your pipe and smoke it Liberty Media soy boys.